Thursday's Education Day event means concentrated visiting bus traffic and temporary closure of Craver Road. Expect delays on Van Landingham and Mary Alexander Roads between 12 and 3 p.m.
Niner Transit will alter routes from 8 a.m. until 4 p.m. All routes will be affected. Detour maps follow. Stops that will not be serviced during detour hours will be marked with signs. 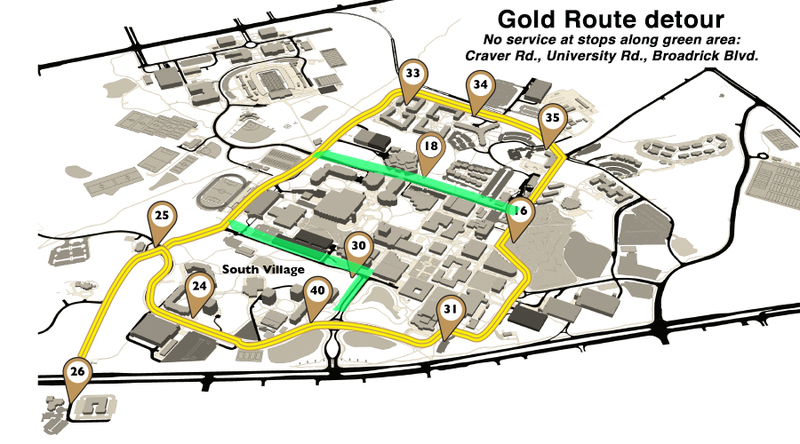 The UNCCNextRide app will not reflect detoured bus routes. Arrival estimates will be inaccurate until regular service is restored late Thursday afternoon. Gold buses will not stop along Craver Road, University Road or Broadrick Boulevard. No service to Popp Martin Student Union, Cone Deck, Reese or PaTS. 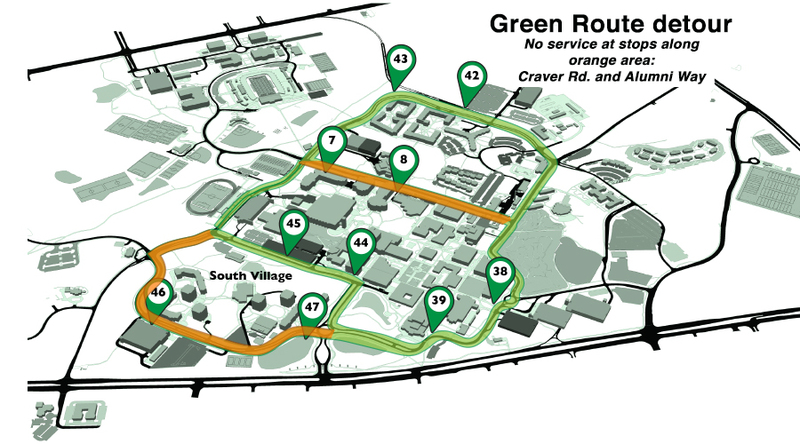 Green buses will not stop along Craver Road or Alumni Way. No service to Popp Martin Student Union, Auxiliary Services or Levine Hall. 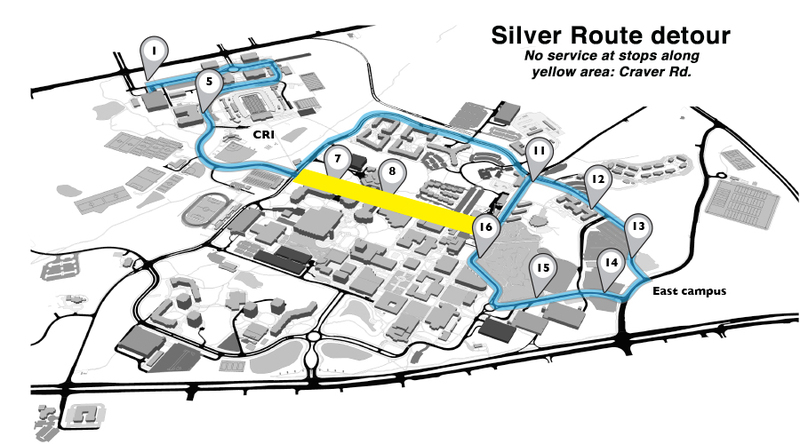 Cross-campus service will exclude Craver Road stops: PaTS, Popp Martin Student Union and Woodward. Niner Paratransit will operate as usual. Those with premium F/S and/or ADA parking privileges for Lots 15 and 16A will be allowed entry. For specific parking and transportation questions, call the PaTS Communication Center, 704-687-0161. Parking and Transportation Services does space counts a few weeks into every semester to check that parking supply is sufficient for demand. These counts also inform planning for future parking facilities. All parking designations are counted: resident and commuter students, facutly/staff, visitors, ADA parking, etc., but because students are the population for whom most of campus parking is designated, the following information focuses on decks and lots open to those with student permits. It comes as no surprise that parking is especially tight this year with the loss of Lots 18 and 19. Italicized entries are areas most likely to be filled between 9:30AM-11AM. ** Student parking space total. Does not include Faculty/Staff gated access, reserved, ADA/van accessible/handicapped, motorcycle, metered, visitor or discount remote parking. Campus total 13,414 (down 517 spaces from last year's total of 13,931). It's pointless to circle a full deck or lot. Students do not generally come-and-go in steady streams but in hour-and-a-half bursts based on when classes begin and end. A full deck or lot at 9:30 a.m. will likely remain so until around 1 p.m. or so. Now is the time to recharge your Optional Dining Account because from now until November 10, deposits of $100 or more get bonus dollars! That's free money to enjoy your at any campus dining venue, any time you like. For those on meal plans who find the Declining Balance (DB) portion of the plan is running low, supplement those funds by recharging your ODA and maximize it with the bonus. Like ODA funds, bonus dollars do not expire and roll over semester to semester, year after year, as long as you're enrolled. Bonus dollars are automatically added to ODA deposits* and reflected on your account. This offer is open to all students, faculty and staff. Deposit to ODA online . Offer expires 5:00 PM, Tuesday, November 10, 2017. *Bonus dollars credited the Monday after deposit made. 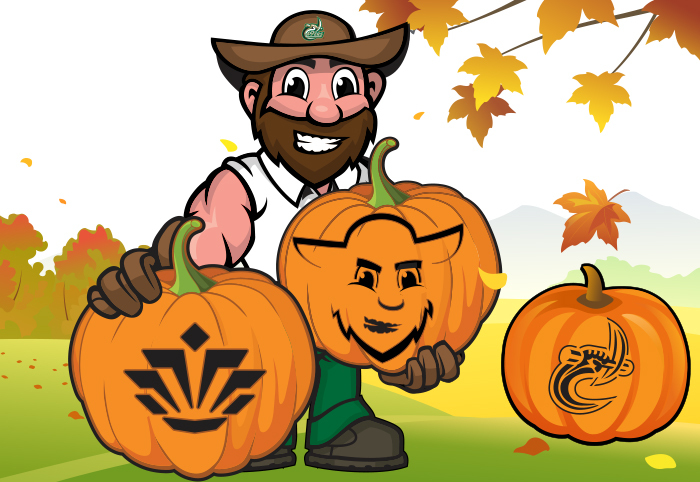 Punch up your harvest or Halloween decor with Niner Pride; download these Charlotte 49er patterns to use for pumpkin carving or painting. After a thorough RFP and selection process, Academy Bus was chosen to operate UNC Charlotte’s campus bus system. Academy is the largest privately owned and operated transportation company in country, serving the East Coast for more than 40 years. Getting around campus is now bigger, better, later and often-er than ever before. Bigger – Niner Transit buses are 40 feet long and hold a lot more passengers than previous 29 ft. CATS commuter buses. Better – PaTS has directed Academy to provide continuous service; driver breaks are covered with little-to-no interruption and breakdowns are promptly replaced. Later – seven day a week service until 2:30 AM! Often-er – more buses on each route means shorter wait times. Two buses run on Green line, three on Gold line and four on Silver Line. Niner Transit buses have two doors. The front door is for entering passengers; the back door is for those exiting. Loading and unloading is more efficient and safer this way. Do not attempt to enter the rear door. Drivers cannot see you there. Never chase a bus! If a driver passes by your stop it’s because the bus is at capacity. Wait for the next bus; it usually only takes a few more minutes. Class schedule influences ridership demand; buses may fill to capacity especially around 9 a.m., 10:30 a.m., 1 p.m. and 3 p.m. Buses are not like trains; they are subject to congestion, traffic, and crosswalk stops. Service may slow around 9 a.m., 10:30 a.m., 1 p.m. 3 p.m. and 5 p.m. The current Niner Transit buses are temporary, assembled from Academy’s existing fleet. Brand new Xcelsior buses are being built for UNC Charlotte, with delivery expected late spring. There is no service on holidays when the University is closed. See website for modified schedules during class breaks. During peak ridership times, please slide toward the window so someone can sit on the aisle-side seat without having to ask. Place backpacks on your lap or on the floor, taking care not create tripping hazards near the aisle. When capacity reaches standing room, move all the way to the back of the bus so there’s room for others to get on. Buses will accommodate two rows of standing passengers. Simple courtesies and an occasional “excuse me,” and “thank you,” go a long way to making the ride more pleasant for everyone. For Niner Transit and specific comments/questions about campus transportation, contact Helena Connors, hconner2@uncc.edu. For immediate questions/concerns, call the PaTS Communication Center, 704-687-0161. 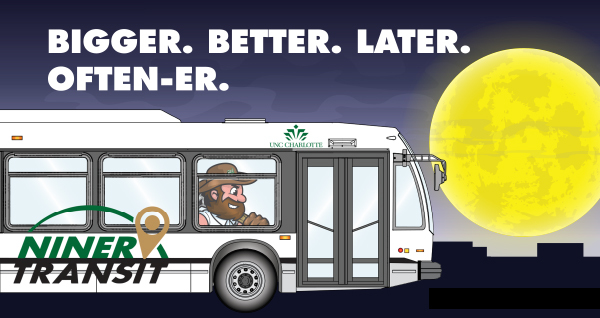 Niner Transit information and monitoring is also on Twitter @unccnextride and @unccparking. Lost and found: Items turned in from buses are sent to the Campus Police department. 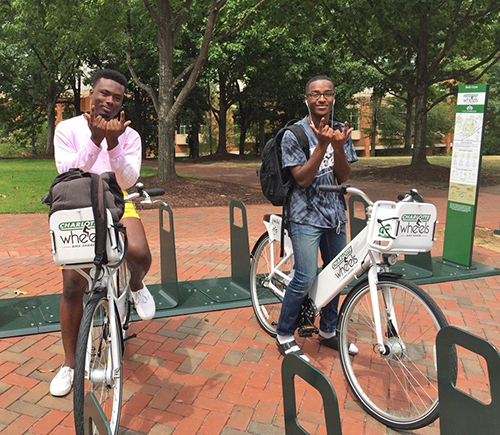 Having a bike share program at UNC Charlotte has been in the works for YEARS. The wait is finally over; Charlotte Wheels is live! Ten rack corrals were installed and 50 Gotcha Bikes arrived last week. Students discovered them and began riding almost immediately. The first thing riders notice is the quality of the bicycles. They are sturdy without being too heavy, beautifully balanced, and have both coaster and hand brakes. Instead of a chain, the bikes are belt driven and have Shirmano three-speed internal gears for taking on campus hills with surprising ease. A basket with bungee cords secures books and packages and safety lights illuminate both front and rear. And no one who was ever a kid can resist the thumb-ringable bell. Accessing Charlotte Wheels is easy. Bikes can be reserved directly from the computer on the back of the bike or through the Social Bicycles app. Lifestyle, a $30/year membership that gives two hours of ride time per day. Here's an example of point-to-point use. A student, we'll call him Norm, reserves a bike that's parked at the corral between Smith and Prospector via app or bike keypad. He enters his PIN to unlock the bike. Norm's intent is to ride up to CRI for a class that starts in an hour. As he glides down Craver Road, he decides there's time for a coffee at the Student Union Starbucks. Norm activates the "hold" feature on the bike to stop the clock for up to 30 minutes and locks up the bike. One latte and a little while later, he has ended his ride and locked the bike at the Grigg/EPIC corral. His time with the bike was 55 minutes. The cost to Norm was $0. Bike share will be a boon to resident students, commuters, staff, and visitors alike. PaTs Transportation Manager, Helena Connors, is excited to see the program finally in motion. "Not only will Charlotte Wheels offer a new mode of transportation to get around campus, it will open up new places to explore — like the Greenway." Jerry Mann, avid cyclist and former director of the Popp Martin Student Union, interrupted his retirement to help PaTS launch the program. "Students, faculty and staff now have the freedom to pick up a bike at a convenient location," he said, "and immediately travel around campus at a low cost, while also burning calories and utilizing non-fossil fuel transportation." 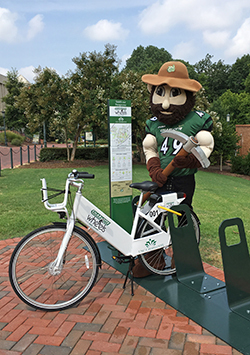 Several groups and departments helped bring the dream of bike sharing to UNC Charlotte. They include PaTS and Business Services, Facilities Management Planning and Grounds units and the Office of Sustainability. Special thanks go to students from the Charlotte Green Initiative, who provided grant funds and more importantly, the inspiration and impetus to bring Charlotte Wheels to campus. Important safety note: Helmet use is strongly advised. For those who do not own a helmet, Bikeline of Charlotte, 8528 University City Blvd., (in shopping center across from main entrance of campus) offers quality helmets and will provide proper fitting. Norm may have been first to ride, but #UTOP17 has done plenty of test rides since!!! Soon, you will need your 49er ID card to access gated parking decks and lots. Parking permissions are now linked to the 49er ID cards. Gated decks and lots are getting new license plate recognition technology (LPR) equipment. Until installation and calibration is complete, your new 49er ID card will be the only way you can enter and exit the gated decks and lots where your permit allows you to park*. Tapping your card at a contactless reader will raise the gates for entry and exit. Look for signs at deck and lot entrances that indicate when the ID card requirement will begin. After the new system is fully operational, you should still keep your 49er ID card with you to prompt gates if LPR ever fails to read your plate. *If you have not yet picked up your new 49er ID card, please do so right away. Visit the 49er ID Card Office, located in the Auxiliary Services Building. Unexpired full-time permits have a way of showing up on Twitter and Craigslist this time of year but UNC Charlotte parking permits may only be bought through PaTS. Permits are registered to a specific person and vehicle. Buying and then using a permit registered to someone else may subject you to fines and other penalties. Here’s some welcome news for those taking classes or working on campus this summer: PaTS will be running 15-passenger shuttles on Red and Green Lines throughout the summer, May 15 - August 1 (except holidays when the University is closed) from 7 AM until 11:30 PM weekdays, 3:30 PM - 11:30 PM weekends. Expect some temporary parking disruption/displacement this summer as capital construction projects begin and new license plate recognition and gate systems are installed. 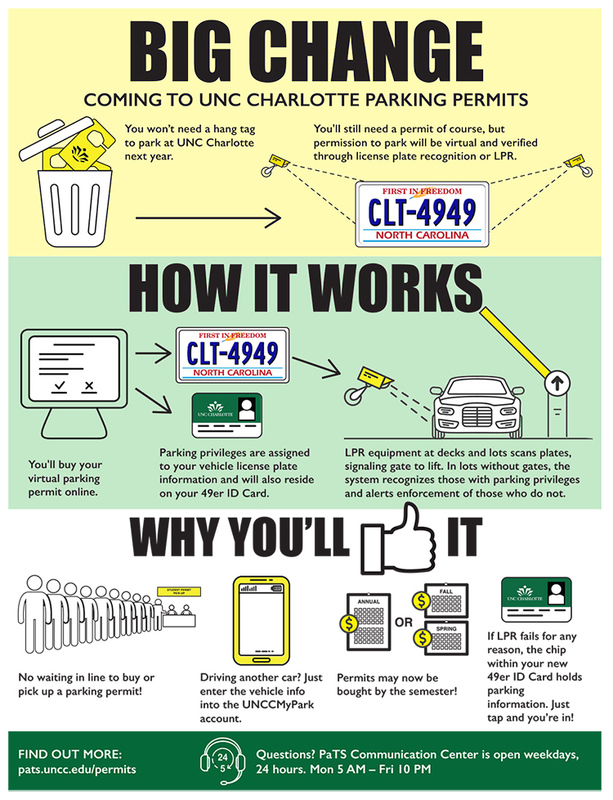 Follow @unccparking on Twitter for the latest information. Lots 18 and 19 are closing permanently this summer. 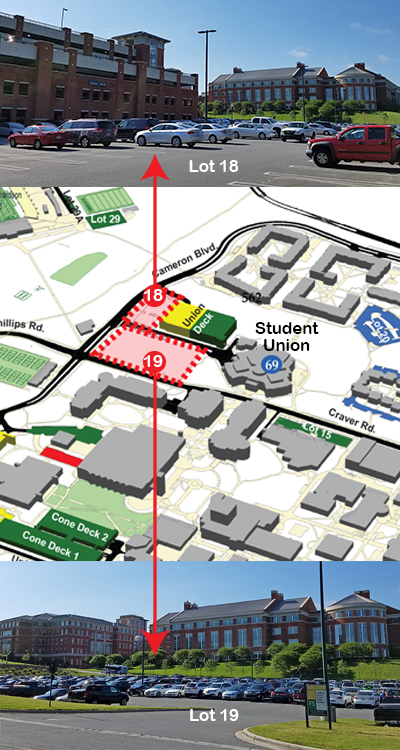 Lot 18 is closing to expand the Union Deck, ultimately making up for the spaces that will be lost in Lot 19. The Union Deck will remain open, though there may be certain areas that are temporarily unavailable during construction. Lot 19 is closing to make room for the new Health and Wellness Center – anticipated to open in fall 2019. This brand-new facility will feature multipurpose recreation courts, an indoor pool, fitness studios, an elevated running/walking track, plenty of cardio and strength training equipment, and more. Visit Recreational Services for Five Things You Need to Know about this new project. The closest alternatives are East Decks 2 and 3 and West Deck, areas which should easily accommodate demand during the summer months. 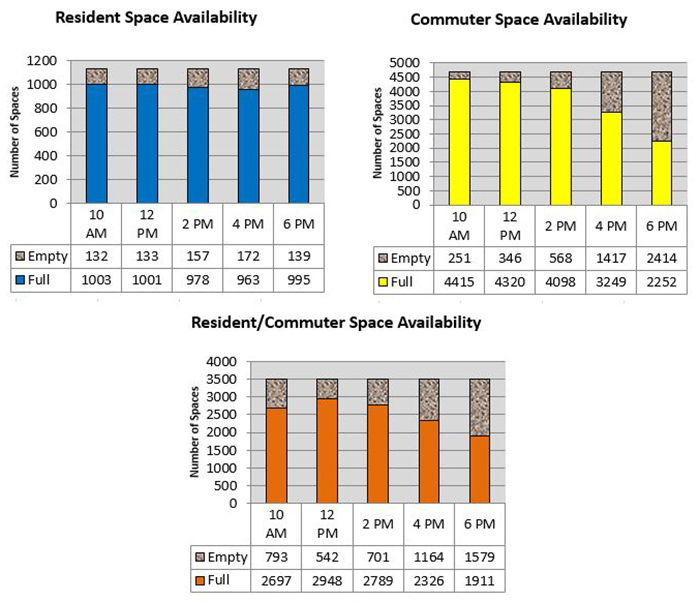 However, during fall and spring semester, East Decks 2 and 3 and West Deck are typically at capacity from 9:00 a.m. to 2:00 p.m., Monday through Thursday. Those decks, and the lots closest to them, will likely fill even earlier in the 2017-18 academic year. Then, North Deck and CRI Deck will both be good parking alternatives even though they are the farthest from the center of campus. When classes begin in August, these decks will be served by greatly enhanced bus service – with expected wait times of eight minutes or less. There’s no way around it: These closures are going to be inconvenient for those who normally park in these lots. Parking demand should ease somewhat when campus gets used to the advantages of a more vigorous bus system and light rail service to campus begins. By summer of 2018, the Union Deck expansion is expected to be completed. This will yield 570 parking spaces, approximately 200 more than were available when Lots 18 and 19 were in use. Shortly after the “all-campus” email went out with the subject line, “License plate recognition coming to parking permits,” call volume into the PaTS Communication Center spiked, as anyone would expect. This is a big change that will affect everyone who drives to class or work here. Here’s some background on why the system needed to change and how License Plate Recognition (LPR) was the system that PaTS and Business Services, after more than a year of research, decided to implement. Maintaining a defunct product without vendor support, parts, etc., is neither practical nor cost-effective. This presented PaTS with an opportunity to find something better that could keep up with campus growth and offer features that students, faculty and staff had been requesting. For students, the pain of standing in line to buy or pick up your parking permit is OVER. No more having to get your permit before classes start or pay visitor parking fees on the first day of class until you got that permit in your hand. Now you’ll be able to go online, set up a UNCCMyPark account, register your vehicle information and instantly have parking permissions linked to your license plate and to your 49er ID Card. Waiting for a financial aid refund before you can purchase a permit? The new parking system’s mobile interface allows you to buy temporary daily permits through an app or web portal. No permit line; no having to pay the hourly rate in a visitor deck. For YEARS students have requested that permits be available for purchase by the semester. With LPR, you will now be able to buy your student permit for the year or for each semester or summer term. Those who know they will need to commute all year can save a little time and money by purchasing a full-time annual permit at the beginning of the academic year. At the same time, a student who is graduating in December doesn’t have to pay the full $450 for an annual permit, return it to the PaTS office after Commencement, and then wait for that prorated refund. Beginning this fall, they’ll be able to purchase a semester permit, which will get them to graduation. Changing vehicles or driving a rental car for a few days will no longer require a trip to the PaTS office. Updating your information can be done through an app, web portal or with a phone call. The new system is flexible and expandable. Look for customer-friendly features in the future, like real-time space counts so you’ll know exactly what decks and lots have availability when you arrive on campus. 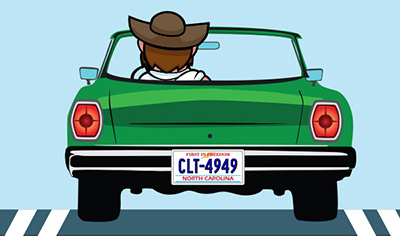 You purchase an optional LPR-readable UNC Charlotte plate for the front of your vehicle. PaTS has sourced a product that works well with the LPR cameras. They are expected to sell for $20. This plate is potentially just a one-time expense; it is valid for as long as it's legible and your state-issued license plate number remains the same. Will the change to LPR make permit prices go up? Permit prices for full-time permits will be the same for 2017-18, which makes the fourth year in a row without an increase. The primary factor that determines permit price is the cost of new deck construction and replacing flat lots with decks. As existing surface lots make way for new buildings and those spaces are replaced with decks (as per campus Master Plan), permit cost go up accordingly because parking is self-supporting. * A rate increase may be necessary by 2018-19 to support the University’s continued growth, but we won’t know that for sure until sometime in 2018. For specifc questions about virtual permits or parking at UNC Charlotte, the PaTS Communications Center is available 24-hours on weekdays (5 a.m. Monday – 10 p.m. Friday), or you can write pats@uncc.edu. We’re also on Twitter, @unccparking. * State funds are not used to pay for parking facilities; collected citation fines cannot supplement construction or maintenance of parking facilities.